This DN0003 design note is applicable to the storage subsystem microcode version 3.0 and above. This DN0003 design note is licensed to GR8BIT Engineering Community, and put into public access as an evaluation of the quality of product and related documentation and support services for potential customers. How much free memory do I have? Special thanks to Raymond van der Meulen (testing), Dominique Chuderski (testing), Jan Wilmans (DOS2 ROMs) and Albert Beevendorp (volume serial numbers) for help and support during development and testing of the GR8BIT storage subsystem. Purpose of this document: This document is intended to provide to GR8BIT Engineering Community members, as well as other interested users and hardware, software and firmware developers who want to use GR8BIT storage subsystem v.3.0 and above, and use its API to connect and operate their own devices. Bootable from LVOL (hard disk) in DOS1 and DOS2 modes. Storage subsystem now has built-in GR8STORM™ (GR8BIT storage manager) utility for subsystem configuration and hard disk preparation for use/recovery. Standalone GR8HDD.COM utility was discontinued. 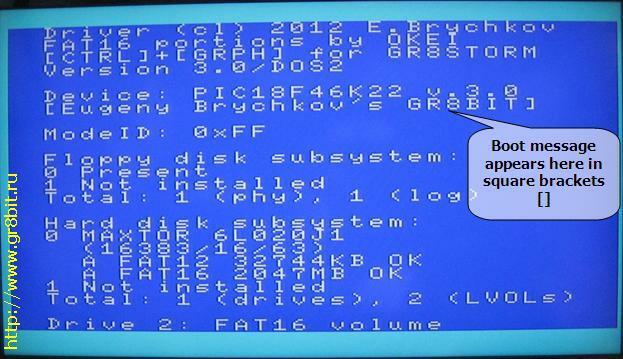 Note: all references to FAT16 partitions assume usage of GR8BIT storage subsystem in MSX-DOS 2.20 mode. FAT16 partitions are not available for read/write in MSX-DOS 1.0 mode. GR8BIT formatted diskettes are readable and writeable by PC systems; PC systems. formatted diskettes are readable and writeable by GR8BIT, but not bootable. GR8BIT hard disk drive volume structures are compliant with PC systems conventions. 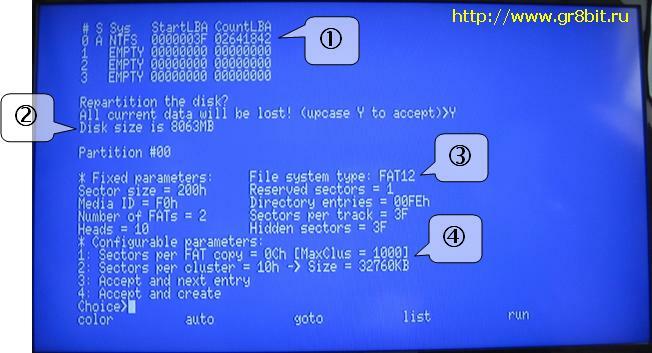 GR8BIT can configure, read and write FAT12 and FAT16 file systems, created by PC systems. GR8BIT hard disk portion of the driver code uses LBA fields within MBR to get logical volume (LVOL) configuration, and the converts LBA into C/H/S in order to support hard disks with no LBA capabilities (32-bit mathematics are embedded into microcontroller's microcode). Diskettes formatted with 9 sectors per track (360K/720K), and diskettes formatted with 18 sectors per track (1.44MB). GR8BIT disk ROM does not follow Media Descriptor preset diskette configuration conventions, and it gets diskette configuration information from its boot sector. Storage subsystem v.3.0 automatically updates physical configuration of the diskette in its tables, and operates proper diskette information even if system does not invoke DSKCHG or GETDPB system calls (e.g. Metal Gear 2 bootable 720K diskette). HDDs operating in C/H/S mode; maximal configuration is 65535/16/63. Logical drives (up to 2) located on the HDDs with up to 65536 sectors in size (32MB) in 16-bit addressing mode and up to 4,194,304 sectors in size (2GBytes) in 23-bit addressing mode. There's no limitation on the location of LVOL on the hard disk as all 4 bytes (32 bits) are used to address LVOL base. Both FAT12 and FAT16 partitions are supported, no additional driver (e.g. FAT16.COM) is required. Diskette format routine will always write DOS2-type boot sector. Flash ROM microcode version 3.0 to the GR8BIT storage subsystem EEPROM chip (IC3, W24C512, located on the I/O board), and flash PIC18F46K22 microcontroller's EEPROM with microcontroller's firmware version 3.0. Partitions 2 and 3 - of your choice, either FAT12/FAT16, of any configuration. The rationale for such recommendation is to have LVOL0 with minimal number of FAT sectors with DOS1-supported OS to save high memory space when you boot into DOS1 mode, but at the same time have fully functional and bootable LVOL located on the hard disk. At any time you can use GR8STORM to deactivate LVOL0, and have LVOL1 of 32Mbytes of size appear in the GR8BIT drive map as first logical device located on the hard disk. Here're quick facts which may help you understanding how system behaves, and why it behaves in certain way. Understanding of the matters will allow you to perform initial troubleshooting and investigation. When using DOS1 kernel mode driver explicitly marks all the invalid volumes, including FAT16 volumes, with special media descriptor 0C3h, and such volume becomes inaccessible. This mechanism is implemented in order for system not to damage device's structures and data in DOS1 mode. You can configure GR8BIT storage subsystem in smart ways which fit your immediate requirements. The configuration information is stored within microcontroller's EEPROM and is kept when you switch off the system. Configuration is performed using built-in GR8STORM™ utility. During any prompt for your input you may press CTRL-C or CRTL-BREAK keys to cancel the operation, get out to the higher level menu, or exit the utility. Please note that after specific changes to the configuration of LVOLs you are prompted to reboot the system. Structure of GR8STORM's menus is presented in table 5.1. Operation mode defines the way how storage subsystem functions. It has several settings, which can be combined together to create a set of handy configurations for various applications. 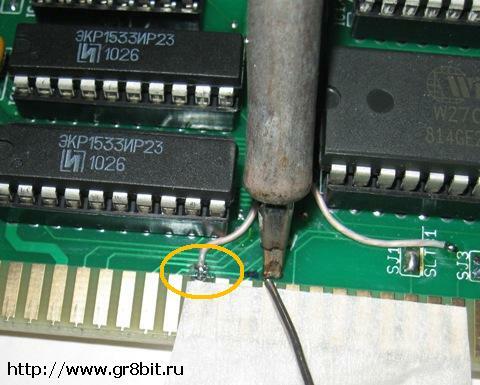 The last option Write to EEPROM writes settings to the microcontroller's EEPROM. In order for changes to take effect you will need to reboot the system. 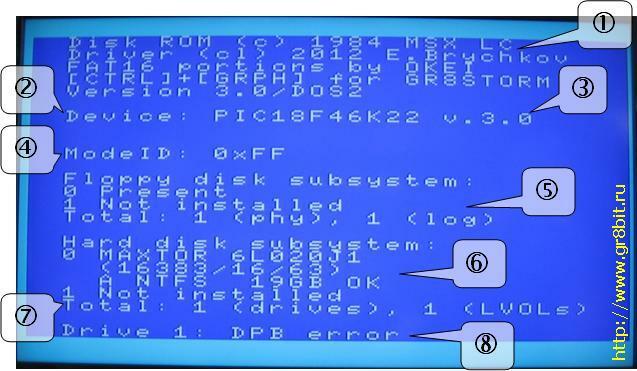 Examples of applications: operating GR8BIT in DOS1 mode and lacking of user memory, you can disable phantom floppy. To boot from LVOL in DOS1 mode prioritize HDD first, and then drive A: will appear to be first LVOL configured. Disable floppy subsystem if you do not use it. You may have message of maximum 24 characters displayed at the boot of the GR8BIT during initialization of the storage subsystem (fig. 5.1). 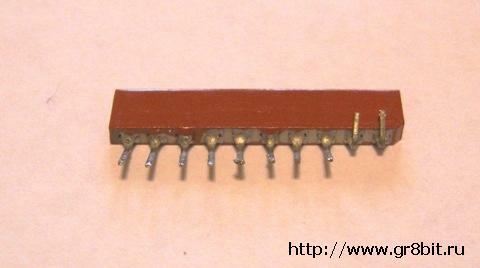 This message is stored in microcontroller's EEPROM, and is not lost when you power system off. We advise not to put any text there for which you would feel uncomfortable or judged inappropriately. This section of GR8STORM allows you to re-initialize storage subsystem, update floppy boot sector and configure hard disks for use. Choosing Partition hard disk starts the process of the hard disk partitioning and initialization. It initializes whole the media, to re-initialize LVOL please use "Initialize/recover" submenu. Initialize/recover Logical Volume (LVOL) will display two submenus: initialize LVOL - also known as quick format, and recover LVOL structures. Former uses LVOL recovery information contained in MBR in order to reconstruct and restore all the LVOL's control structures (original boot sector, clear FAT, and clear directory), but latter will just fix boot sector, and signature of the first FAT (without clearing FATs and directory). If you have issues with storage subsystem, or want to view control data of the microcontroller and storage devices, you will use diagnostic outputs for troubleshooting. Display HDD0's MBR and LVOLs' boot sectors displays master boot record (MBR) of the hard drive 0 (master IDE), and boot sectors of all the LVOLs. Analyzing this information you may get a clear picture on how hard disk space is partitioned, and where boot problems may happen. Display HDD1's MBR and LVOLs' boot sectors displays the same as previous menu item, but for hard drive 1 (slave IDE). There're several very useful shortcuts available at the beginning and at the end of the GR8BIT storage subsystem initialization. Please refer to the table 5.2 for details. Remember that you should allow GR8BIT PS/2 keyboard controller to initialize within 4 seconds after system power on, not pressing any keys during this period of time. 5.3. How much free memory do I have? Answer to this question is very important because CPU visible memory is limited even with GR8BIT having mapped 1MB of main SRAM. Ability to run programs and games is dependent on how much memory is available, and where system-s control structures are located in the memory. If you have no storage subsystem installed or configured in the system (e.g. if you are in DOS1 and no media was detected), then you will have about 28.8 Kbytes free memory. If you start system in DOS2 mode (not necessarily boot into the MSXDOS), DOS2 kernel will have advanced memory mapping capabilities, and disk buffers, control structures and other stuff will be located in the last pages of the mapper RAM. It will not consume much of valuable space in the high visible memory space (in bank 3, from 0C000h...0FFFFh), and you always will have 25 Kbytes user space free in BASIC and 57 Kbytes free with operating system loaded, regardless of number of logical drives and their sizes. However such an advanced configuration may not be supported by earlier software designed for DOS1 with no memory management, software performing its own memory management. Such software may not work properly in DOS2 environment. 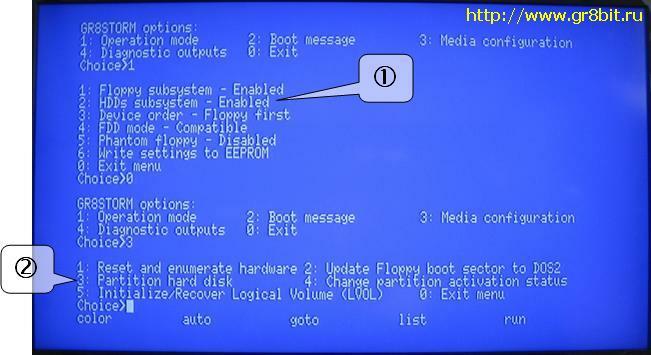 If you start system in DOS1 mode (by booting from DOS1-type floppy disk or holding Backspace key on storage subsystem initialization), you will get DOS1 kernel with no memory management, and information about drives and buffers will be allocated in the memory bank 3 and user available memory will be automatically reduced by the amount allocated. Consider configurations described in table 5.3. For every LVOL configured system will allocate space equal to 512 bytes multiplies by the number of sectors in file allocation table (FAT). See table 5.4. Please note that in DOS1 mode if there're no devices found to configure, floppy and LVOLs, storage subsystem ROM will not be installed. Before GR8BIT will get to operating system (OS) load procedure, or to the BASIC if OS in not present on the first media system finds, disk ROM will perform initialization of the storage subsystem and enumeration of the logical volumes (LVOLs) located on the hard disk drives. DPB Error: boot record of the volume is invalid, thus DPB cannot be constructed out of it. LVOL will be configured using dummy DPB. In the DOS1 mode subsystem will only attempt to boot from first drive configured in the system drive A:. If you have floppy disk system configured first, it will boot from floppy drive 0, if hard disk system first, then from first LVOL is configured from hard disk 0. In DOS2 mode GR8BIT will try every storage device available (max 8) to see if it can boot from it, thus if you have configured floppies first, with single floppy and phantom drive disabled, it will first try booting from floppy drive (A:), and if unsuccessful will boot from first LVOL (B:). There're operating system files on the media - at least MSXDOS.SYS and COMMAND.COM (you can use FORMAT routine's option 4 or copy them manually). 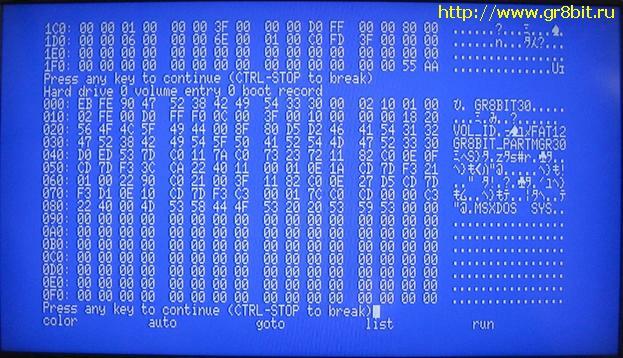 When GR8BIT starts booting, it automatically applies FAT16 patch by OKEI (fig. 5.3). If, for some reason, you do not want FAT16 patch to be applied, hold "2" key at the start of the boot process. If storage subsystem detects no floppy drives, first LVOL becomes drive 0 (A:) and can be booted from even in DOS1 mode. Note that DOS1 kernel requires at least one logical drive to be configured. If you detach all storage devices from controller, or disable floppy and hard disk subsystems via operation mode menu, system will not install DOS1 kernel at all. Important feature of the GR8BIT storage subsystem version 3.0 is that it has original versions of MSX-DOS and MSX-DOS2 flashed into its microcontroller. You may have MSX-DOS operating system without having any media containing required files. Use FORMAT built-in utility from either MSX-BASIC or from MSX-DOS. Important: FORMAT utility was relocated to the end of the page 2 of the DOS2 storage ROM, and will work with built-in FAT16 patch installed. However if you will run external FAT16.COM application with /R key (uninstall) and then install it back, FORMAT utility will stop working until you remove FAT16 patch using this external FAT16.COM application. It happens because FAT16.COM disables FORMAT utility (it does not know that GR8BIT storage subsystem has FORMAT utility code relocated to the safe place in its ROM). There's nothing about configuration of the floppy drives other than just attaching them to the respective connector on the floppy cable. Ensure that you use regular FDDs you used to use with your PC with DC (disk change) option (pre-) set. Disk drives which are configured with RDY option will not work. Configuring diskettes involves formatting them - laying out sector information in the raw media space, and filling these sectors with proper information (boot sector, FAT, directory). 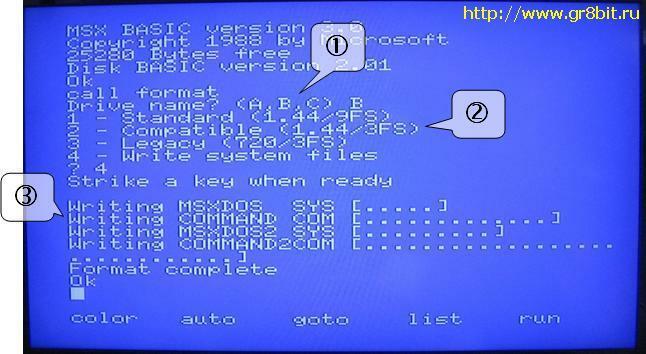 Format floppy disk using GR8BIT's MSX-DOS format command or BASIC's call format command. 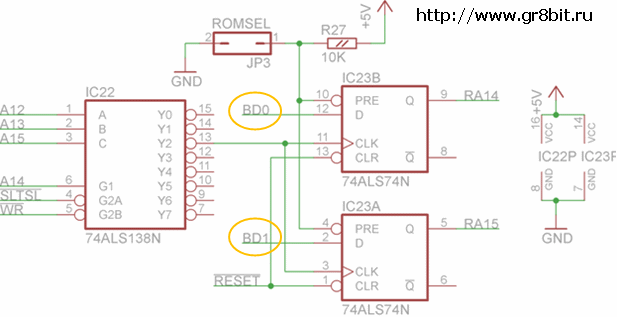 Both invoke the same formatting microcode residing in the ROM and microcontroller. Usage of these commands in scripts/applications is not recommended. When you invoke the ROM-embedded formatting command (fig. 5.4), you will select logical drive (and media in it) to perform operation on (1). You will see options available (2), and dialogue string. If you select option other than 4 (Write system files) for LVOL, command will abort with message "Use GR8STORM to initialize LVOL". Choosing option 4 will load DOS1 and DOS2 system files onto the selected media. You can abort the command any time until it starts formatting by pressing CTRL-STOP or CTRL-C key combination. You can load image onto the diskette. Note that it can be done only after diskette was properly formatted (e.g. physically prepared for user data load). If you have formatted floppy disk on the PC, please use GR8STORM™ Update floppy boot sector to DOS2 submenu instead of FIXDISK.COM to make it bootable by the GR8BIT (FIXDISK will return Invalid MSX-DOS call). You will use GR8STORM built-in utility to partition the hard disk, initialize or recover volume structure on its LVOLs. The utility works in 80-column screen mode in order to provide the best layout of the information on the screen. Invoke GR8STORM using "call gr8storm" BASIC command or holding CTRL+GRAPH during storage subsystem initialization. Fig. 5.5 shows start of the dialogue; first ensure that hard disk subsystem is enabled (1) and then follow to the "Partition hard disk" menu (2). You select hard disk drive number, and have its partition listed (1 at fig. 5.6). Then you confirm that you want to proceed further, and get into the partition configuration menu. You see disk size listed (2), and note that it is maximal supported size in CHS mode and not actual hard disk drive size which can be larger. First partition will always be FAT12 (3). FAT12: Clusters = SpF*512*2/3, maximum is 12*512*2/3=4096 (1000h) clusters. FAT16: Clusters = SpF*512/2, maximum is 256*512/2=65536 (10000h) clusters. In terms of media format, cluster numbers 0, 1, 0FF8..0FFF for FAT12 and 0FFF8...FFFF for FAT16 have special purpose, and are not used for definition of data allocation. Sectors per Cluster (SpC) identify how many 512-byte sectors are allocated for each cluster. More SpC means larger LVOL, but also means more usable space may be lost on remainders of the files or small files. After the calculation the LVOL you are going to create will have the size equal to Clusters * 2SpC * 512 bytes and maximal value for FAT12 volumes equals to 4096 * 24 * 512 = 32Mbytes, and for FAT16 volumes equals 65536 * 26 * 512 = 2Gbytes. You will see this calculated value in the "Size =" section. You can play with the settings to create different sizes of the volumes, and create multiple, up to 4 volumes choosing menu option "Accept and next entry". LVOLs 1, 2 and 3 created on the hard disk may be either of FAT12 or FAT16 type. When you filled up all 4 entries or chosen "Accept and create", you are again asked for prompt if you really want to proceed. If you choose uppercase "Y", it will rewrite all the control structures on the disk and previous structures will be lost. LVOLs need not to be "formatted" after you finish their configuration with GR8STORM. You can view the structures tool has created for you by going to Diagnostic outputs menu and choosing option 4 Display HDD0's MBR and LVOLs' boot sectors (fig. 5.7 and 5.8). After reboot you may copy system files and application to the newly configured LVOL, and use it as any regular storage device addressing it by the respective drive letter. Limitations: GR8STORM (a) only writes LBAs into the MBR LVOL configuration, and does not write corresponding C/H/S values of start and end of partition; (b) it does not write PC bootstrap code into MBR (PC will not be able to boot from this hard drive), however hard drive is expected to be readable if attached to the PC's IDE controller. Subsystem is based on several components (fig. 6.1), which provide specific API for developers to extend its functionality. Microcontroller with multi-stage architecture was introduced in order to have reliable access to the media, and have unified entry point to any attached storage device. 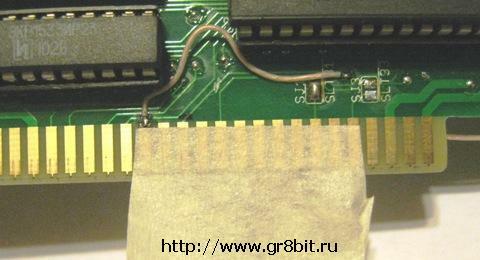 Without MC GR8BIT, and any other MSX-compatible computer, is unable to reliably control floppy disk controller data flow at 500KBit/s speed due to insufficient CPU speed at 3.58MHz system clock. 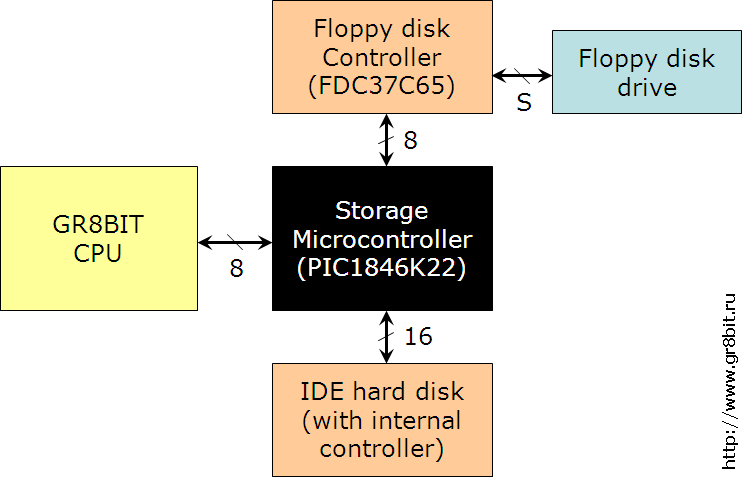 If you want microcontroller to have more functionality for floppy disk controller, you develop modifications and add-ons to the microcontroller microcode. 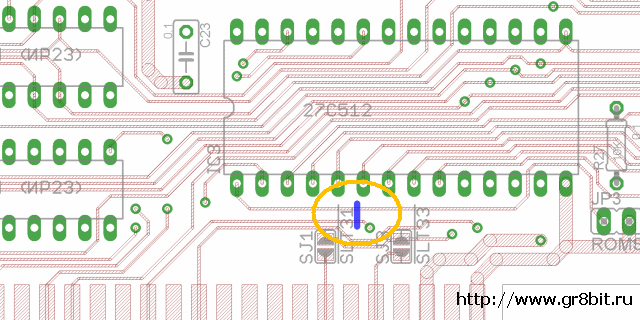 As an example, it is not really required to have IDE disk drive connected to the 40-pin connector - you may design and build adapter to connect any device and alter microcontroller functionality appropriately. If you want to change API between GR8BIT CPU and microcontroller, you will need first have this API defined from MC side, and then implement CPU-side routines modifying GR8BIT storage ROM. Floppy disk controller was initially designed to work in PIO mode; unfortunately all the attempts to make it work reliable in PIO mode did not succeed. We decided to implement DMA transfers, and this way of interfacing succeeded. 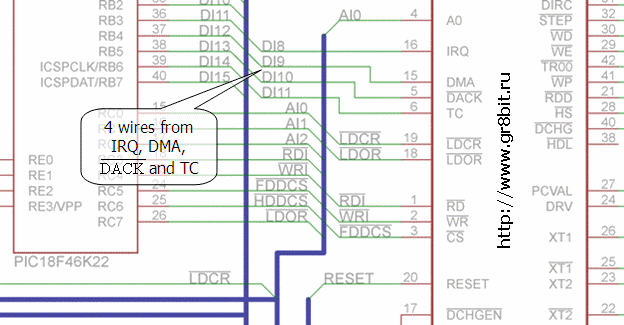 In order for your GR8BIT storage hardware to support DMA floppy disk controller interface and current release of microcode, you will need to add 4 (four) air-wires connecting IRQ, DMA, DACK and TC pins of FDC to the specified pins of port B of MC (fig. 6.2 and 6.3). Unlike initially chosen PIC16F1939, new microcontroller PIC18F46K22 (which is a direct replacement for former) is twice faster and is able to serve GR8BIT CPU requests without additional wait stated introduced by slowdown circuit. PIC18F46K22 has 3896 bytes of SRAM, and it can read up to 7 sectors per one DSKIO API call. After the read operation, MC returns number of sectors actually read for GR8BIT CPU to read valid user data from the MC's data buffer. Such a technique, coupled with DMA access method, dramatically increased floppy disk transfers speed relative to previous implementations. IDE interface uses PIO transfers Mode 0 only and CHS media access method to maintain compatibility with older ATA/IDE hard disk drives. If you wish you can change timing of the IDE bus modifying MC's related microcode to speed up HDD data I/O port access. Unfortunately initial electrical design of the IDE interface has non-critical flaw: it should have pull-up resistors on its data lines. The symptoms can only be experienced if no HDD is connected - due to no pull-up resistors and no active-output device on the bus, storage microcontroller does not read valid value (either 00h or 0FFh), and thinks there's something attached to the IDE interface. 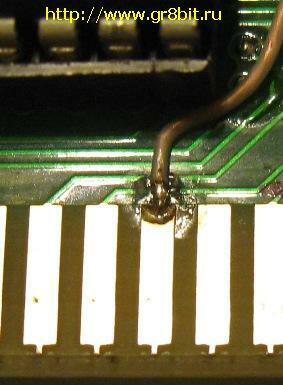 This flaw can be easily fixed by adding at least one resistor pack, 10KOhms in nominal resistance. 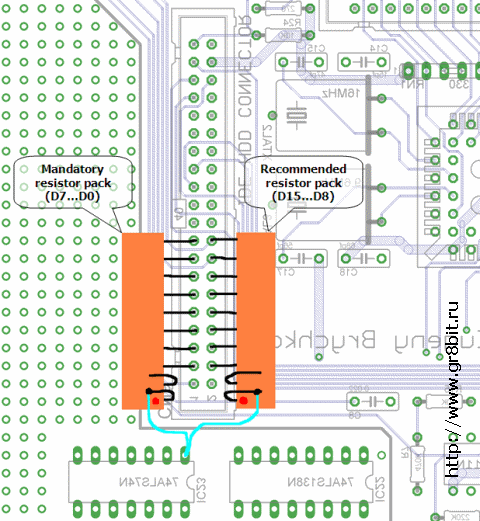 Solder resistor packs as shown on the fig. 6.5. In default design GR8BIT allows its CPU to "see" storage subsystem ROM's content in the banks 1 (4000-7FFF) and 2 (8000-BFFF), first half of the 64Kbyte IC3 chip if jumper JP3 is closed, and second half if it is open. The 16Kbyte pages within 32Kbyte visible space appear exchanged, i.e. if you have JP3 open, then system will see chip's contents in the range C000-FFFF in the page 1 (addresses 4000-7FFF) and contents in the range 8000-BFFF in page 2 (addresses 8000-BFFF). This way, if you do not implement DOS2 mini-mapper, you may have DOS1 ROM image (which is located in the ROM chip in space C000-FFFF) visible to the CPU at addresses 4000-7FFF and allow it to function properly in DOS1 mode. Figure 6.6 shows circuit diagram of the DOS2 mini-mapper. You will add two chips, and cut three tracks on the board. If JP3 is closed, both IC23 trigger Q outputs are set to logical 1, and IC3's A14 and A15 lines are steadily set to 11 (page 3), causing GR8BIT to always see DOS1 ROM image. If JP3 is open, triggers' outputs after system reset is 00 (page 0) GR8BIT can switch between banks writing to the address range 6000-6FFF when storage ROM is visible in the CPU space. Page change is performed when the following conditions are met at the inputs of IC22 (fig. 6.6): A15=A12=0, A14=A13=0 (address space 6xxxh), WR signal is active (system is writing to the memory or port), and SLTSL is active (CPU address points to the sub-slot space identified by the respective SLTSL signal - SJ1 or SJ3 jumpers of the I/O board). 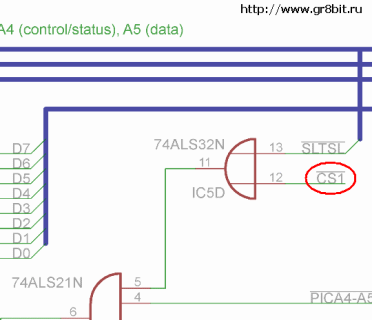 ROM chip select signal need also be changed from CS12 to CS1 (fig 6.7) so that storage ROM pages would appear only in the bank 1 (addresses 4000-7FFF). If we would leave CS12 signal, then CPU may erroneously find something "useful" in the bank 2 and try working with it - and such a condition may yield unexpected results and affect system stability. 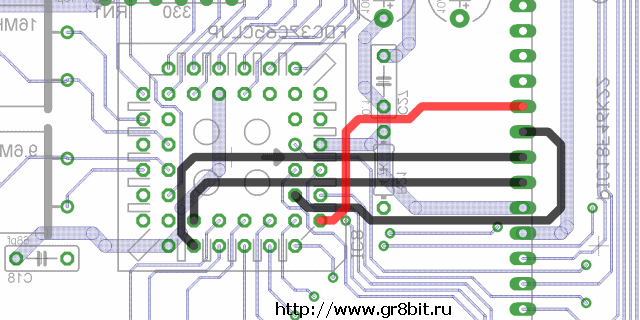 It is important to wire data input lines of the IC23 trigger elements directly to the GR8BUS data lines (BDx), not to the I/O board buffered data lines. 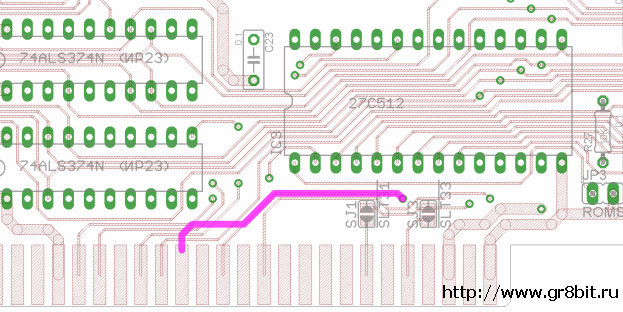 I/O board's data buffer IC1 is activated only for EPROM read using CS1 and SLTSL signals (IC5D), but CS1 signal only activates on read from the bank 1 (see IC31B on the main board's schematic - it uses RD signal to activate de-multiplexer element). Here's the list of steps to implement changes in order to have DOS2 mini-mapper in your GR8BIT system. Remove tape, and clean pads with spirit. 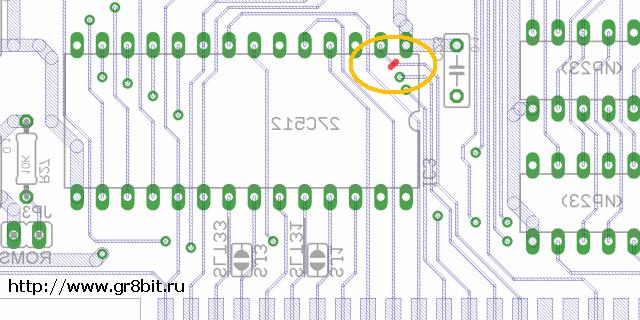 Note: CS1 signal is circled orange on the picture to the left. In this example we tin another pad as CS1 was already tinned before. Solder wires as shown on the fig. 6.13. Keep them as clustered as possible. Application API is used by the GR8BIT and other compatible application programs to access resources attached to the GR8BIT storage subsystem; they will use standard system (BASIC or MSX-DOS) calls. Disk subsystem calls (such as INIHRD, DSKIO, DRIVES, DSKCHG, GETDPB) are not expected to be used by application software (are used by system software). The minor, but important change was introduced to the DSKIO system call to support 23-bit sector numbers: if bit 7 of register C (media descriptor) is reset, then remaining 7 bits are treated as upper sector number. With such a mechanism system and application software can address volumes with up to 8,388,608 sectors (4Gbytes). In terms of DSKIO system call, this 23-bit sector address is a sector offset relative to the base of the LVOL, which is always 32-bit. Hard disks' MBR is not directly addressable by application or system calls because MBR is located out of LVOL addressable space. GR8BIT will flash alternate screen color if application or system software tries to load data onto the stack memory location, with DSKIO returning Write Protected error for read operation. This functionality is very useful in DOS1 mode in multiple disk drive configurations when significant portion of memory is used by the disk buffers and programs may not fit into available free memory. System API is used by the GR8BIT storage subsystem ROM and system utilities to control storage microcontroller (MC). Following is the list of the commands available for the system software (table 7.1). Detailed explanation of the API and CPU-microcontroller data exchange is provided in the next section. This command is used to test if MC is ready to accept commands. CPU sends 0xAA to the MC, and MC replies 0xAA. Next byte read after 0xAA should be 0xFF. INIHRD initializes storage subsystem (floppy disk and hard disk - according to configuration set in EEPROM) and its variables. These commands read or write logical sector. DSKIO allows programmer to address logical devices (not physical ones). Maximal number of contiguous sectors MC can read or write is 7 (512 bytes * 7 = 3584 bytes). Reads or writes are performed to/from MC's buffer, thus programmer should successfully load valid data using BUFACC-W command before writing, and get valid data from the buffer using BUFACC-R command after reading. C/H/S values for floppy drives and hard disks are calculated by the MC basing on the values of sector per track and heads obtained by the MC from respective device's boot sector. ** Relative to the LVOL base in LVOL table for logical volumes, absolute for floppy disk devices. This command reads status of the floppy disk change line off the specified logical device. It returns 0xFF is media was changed since last call, or 0x01 if media was not changed. Calling DSKCHG resets disk change flag. For hard disk-based LVOLs DSKCHG command always returns 0x01 (not changed). DSKFMT command formats floppy disk. It does not partition or format HDD - please use GR8STORM™ built-in utility for these tasks. Returns number of logical devices configured by the storage subsystem. This command returns MC's identification string, terminated with 0xFF. All the characters returned are ASCII ones, except terminating character. MC has 64Kbytes of the internal flash ROM, and it keeps copies of original MSXDOS.SYS (v1.03), COMMAND.COM (v.1.11), MSXDOS2.SYS and COMMAND2.COM (v2.20). Images of this software can be downloaded using SOFTWARE command in 512-byte chunks. By default these images are not designed to be bootable off the MC. Chunk #0 contains package identification information: file name (11 bytes), 0x00 (initial extent #), size in bytes (2 bytes) and remaining fill bytes up to 512 byte chunk size. Maximal size of the package (memory space which can be addressed with chunk ID) is 26 * 512bytes = 32Kbytes. It is practically possible to read contents of MC's flash ROM beyond the last valid chunk of the package. Package image starts at chunk #1. Bytes within last chunk beyond package size are not invalid. This command invokes dialogue between GR8BIT CPU and microcontroller, with CPU (user) provides input to the GR8STORM application, and MC performing requested actions and giving results back to the CPU (user). Dialogue is text-based. Please review section 7.3 for description on how dialogue works. This command allows host to identify the status of the respective HDD. It supplies status register, identifying readiness of the drive, and error register, which contains relevant information in case of status register's bit 0 ERR is set. This command is issued by the host's CPU to perform initial configuration of the drive parameter blocks (DPBs) of the logical devices. DPB data is obtained from boot sector, which is read from the device or volume associated with logical device number supplied. For FAT16-type LVOL command fails with completion status code 0xCD, which signals to host CPU to apply dummy DPB. This command returns flag to the host CPU it should ask user to insert another diskette into the drive, and allows proper operation of the phantom floppy drive. This command is issued by the host's CPU to get current up-to-date version of DPB. In case of success, constructed DPB is located at the offset 0x200 in the MC's buffer. This command reads HDD identification information (such as physical configuration and model string) into the MC's buffer at location 0x000. 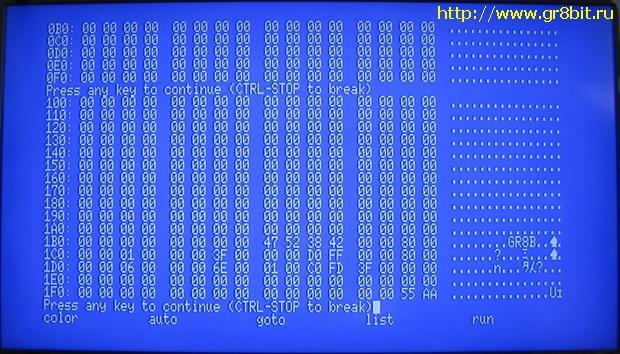 After successful completion of the command, buffer will contain 512 byte structure returned by the hard disk drive. BUFACC command is used to access MC's internal buffer. Valid buffer starts at 0x000 and ends at 0xDFF (3584 bytes), but practically programmer can read and write above this space, altering or damaging MC's operations. 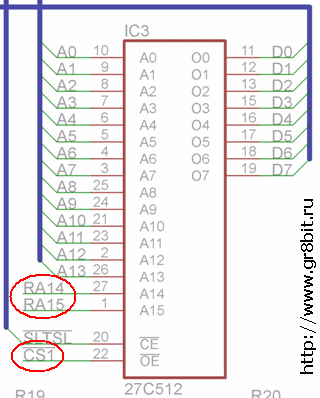 In the example in the table below host reads (0x11) 18 bytes from MC buffer location 0x200 (e.g. DPB image after successful DPB construction by GETDPB command). Some commands, namely GR8STORM and INIHRD, use dialogue method to get information from GR8BIT CPU (user) and inform CPU (user) about its results. GR8BIT CPU receives characters from MC, and displays them. Information exchange is performed in ASCII format, except several control codes. Frequently used codes are listed in the table 7.3 below. End of DN0003 "Storage subsystem v.3.0 Manual".